Joan Burton is Minister for Social Protection and Labour Party TD for Dublin West. Nationally rents have remained notably stable for the last twelve months. 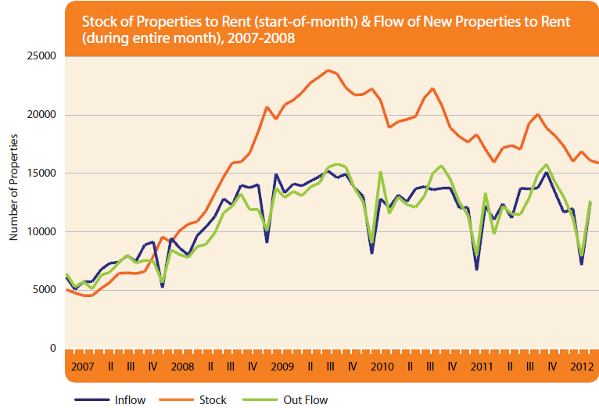 Indeed, rents have stabilised as far back as December 2009, with little change since that date. This quarter under review mirrors this trend. As previous quarterly reports have shown, national rent indices still appear to mask a rural/urban split within the Irish rental market, with rural prices continuing to fall, albeit at a slow pace, and these falls being offset by increasing rents in urban areas. Similarly, the stock of available properties available for rent continues to fall. In January, the total number of rental properties stood at 16,023 (v 16,932 January 2011); a 5.7% decline on the previous year's levels. Against this backdrop of stabilized rents is the continued fall in house prices, with no reliable forecast for the bottoming of the private residential market. Even the more optimistic forecasts still predict further house price falls in 2012. One might expect that rents and prices would move together - and that was certainly the case between 2007 and 2009. However, housing bubbles involve prices getting out of line with underlying rents, so a necessary part of the correction when a bubble ends is that rents stabilise or increase, while house asking prices fall further. The State plays a major role in the private rental market through the Rent Supplement scheme. Rent Supplement provides short-term income support to eligible people living in private rented accommodation, whose means are insufficient to meet their accommodation costs and who do not have accommodation available to them from any other source. The vast majority of these people are unemployed or working on a part-time basis. Since 2005, rent supplement expenditure has increased from €369 million to some €503 million in 2011. The number of people claiming the allowance increased from almost 60,200 in 2005 to over 96,800 at end 2011, a 61% increase. In terms of overall share in the market, rent supplement accounts for approximately 40% of the private rental market. It is essential, therefore, that State support for rents are kept under review, reflect current market conditions and do not distort the market in a way that could increase rent prices for others, such as low paid workers and students. It should be stressed that the rent supplement scheme is not designed to be a housing solution, but only a temporary income support whilst temporarily unemployed. However, during the last few years of this unprecedented economic crisis, more and more people have become long-term dependent on the supplement, with now over 55,000 people on the scheme for 18 months or more. Rent supplement costs are managed by reviewing and setting maximum rent limits for each county, with the premise that there is adequate supply at or below these levels whilst at the same time ensuring that persons in full-time employment, especially those on low incomes, can enter the private rental market and secure accommodation in their preferred area of choice. Over the last two rent limit reviews, carried out in June 2010 and December 2011, the Department of Social Protection has: aligned maximum rent limits to reflect local market conditions at a county level; and, especially in the last review, further aligned maximum limits to reflect availability in each county for those seeking rent supplement support. 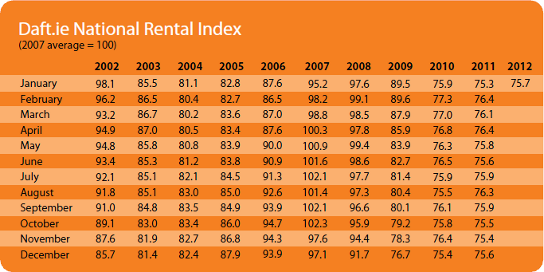 Since the June 2010 review, rental values have stabilised at or near the maximum rent limits in place nationally. The following table presents maximum rent limits as a percentage of asking rates for rents on a provincial basis with Dublin shown separately. The table shows that, provincially, excluding Dublin, the current maximum rent limits for 2 bedroom accommodation units are higher than the current asking average rate advertised within the market. In other words, maximum rent limits are too high based on prevailing market advertised rate averages. 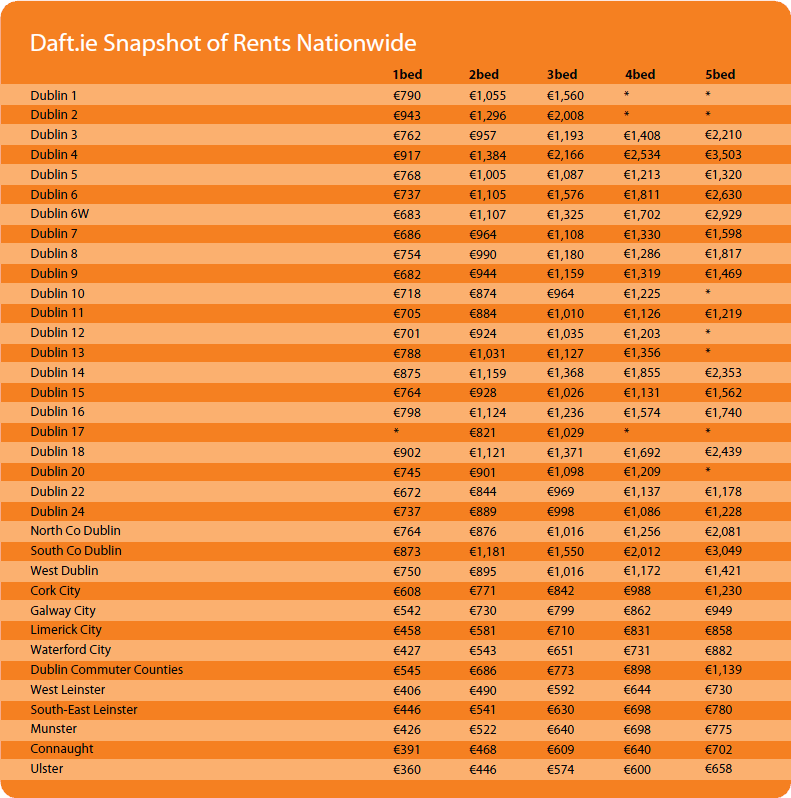 Dublin average rents are, excluding single-roomed accommodation, higher than rent limits set by the Department. However, it should be noted that the above table considers maximum limits as a percentage of average rents which includes: high-end socio-economic areas; penthouses; detached residences etc. Once these are excluded, and focusing on availability there is scope for reductions for all categories, including Dublin. The conclusion from this analysis was that maximum limits were still too high, and were in large part, acting as a floor for landlords in their dealings with rent supplement tenancies and non-rent supplement tenancies alike. This has raised the obvious issue of persons in employment competing directly with those on rent supplement. Similarly, this probably explains, to some degree, the stabilising rent levels since December 2009. It is hoped that the recent rent review will not only bring about savings to the Exchequer, but also have a positive impact on those working and renting, at the same time ensuring that rent supplement tenants are suitably housed. The experience of the previous review showed that landlords, generally, accepted the revised limits, with no case of homelessness or undue hardship reported by rent supplement tenants. It is accepted that there will be isolated cases after this review, where landlords will refuse to reduce the rent they seek, and in those instances tenants will be expected to secure alternative accommodation. Such applicants will be afforded reasonable time periods to secure new accommodation. Department officials administering rent supplement will continue to ensure that the rent supplement recipients' accommodation needs are met. There will be no incidence of homelessness due to these changes. I would like to acknowledge the contribution that landlords have made in cooperating with my Department, providing accommodation to rent supplement eligible tenants, especially over the last few years. I am confident that this rent limit review has maintained the balance of ensuring that rent supplemented accommodation is available to those seeking temporary income support for their accommodation and is helping to ensure that working families, especially those in low paid employment, are not priced out of the market.